The Federal Reserve is telling the world: Prepare for a December interest rate increase. In a speech Wednesday, Fed chair Janet Yellen said the economy has been improving in recent weeks. Translation: unless there is a major hiccup with a bad jobs report on Friday morning, the Fed will probably lift interest rates off their historic lows around 0% when it meets on December 15 and 16. "On balance, both economic and financial information received since our October meeting has been consistent with our expectations of continued improvement in the labor market," said Yellen in a closely watched speech at the Economic Club of Washington D.C. But Yellen stressed that the Fed will move slowly and cautiously in 2016. While the vast majority of economists and stock market watchers now anticipate the Fed will raise rates from about 0% to 0.25% in December, there is a lot of uncertainty about what comes next. In the past, the Fed has hiked rates quickly once it got going. That probably won't happen this time. "Most FOMC [Federal Open Market Committee] participants do anticipate a series of interest rate increases, but they anticipate they would be gradual," Yellen emphasized in the Q&A after her remarks. In numerous speeches lately, Fed members have be open about the fact that raising rates too quickly could harm the markets and U.S. economy, even pushing it into a recession. The two main factors holding the U.S. economy back are the weak global economy, especially China, and the strong U.S. dollar, which has been making American exports very expensive abroad. While Yellen was speaking Wednesday, the dollar index hit a 12.5 year high against other world currencies. The Fed calculates that weak exports slashed 0.5% off U.S. growth this year. But Yellen thinks these factors won't be as big of an issue going forward. China's slowdown "will likely continue to be modest and gradual," she said, and the dollar will move back down as the global economy improves. 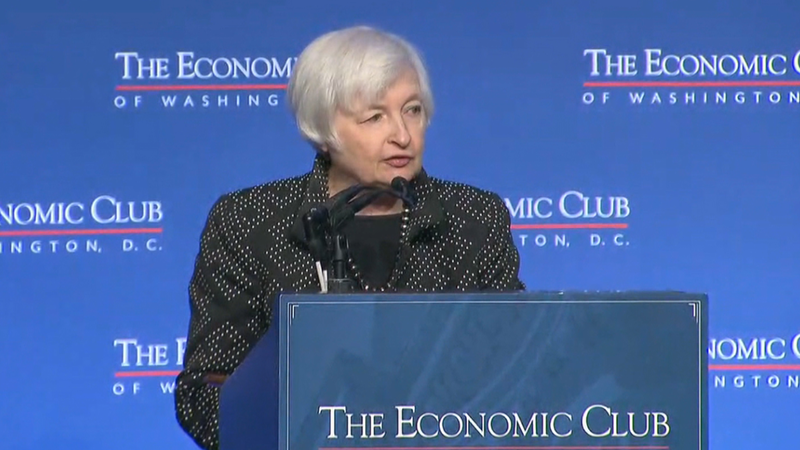 Overall, Yellen continues to emphasize how far the economy has come since unemployment peaked at 10% in October 2009. Now unemployment is down to 5%, which is "near normal." Yellen isn't ready to declare victory though. She points out that 2 million Americans say they want work and are ready to work but they stopped looking for jobs in October because they were so discouraged. If the job market were strong, many of those people probably would get back into the labor force. Still, Yellen sounds optimistic that hiring and inflation will continue to improve and move toward the Fed's goals in the coming months. The president of the Atlanta Fed, Dennis Lockhart, made similar remarks Wednesday as well. A Fed rate hike in December -- or soon thereafter -- "will be a testament...to how far our economy has come in recovering from the effects of the financial crisis and the Great Recession," she concluded. -- CNNMoney's Patrick Gillespie contributed to this article.